This article was originally published on the Evergreen Outdoor Center blog on October 20, 2005. 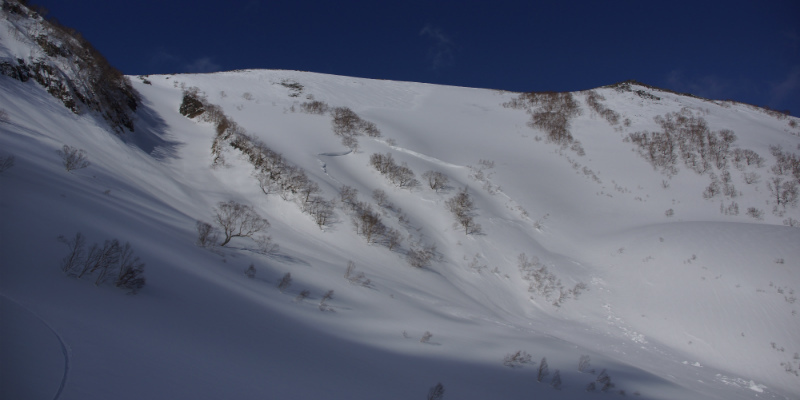 The 19th of February 2000 was not a good day to head into the backcountry of the Japan North Alps. A long spell of cold clear weather had given way to a relentless three day storm from the northwest – a storm straight from Siberia that continued to gather moisture from the Sea of Japan while dumping great amounts of snow in the bowls of the Hakuba Mountains. The ridges were swept clean by the high winds, thus consequently creating a very uneven depth of snow and pockets of unstable wind slab over the steep lee slopes. A faceted layer created by the previous long spell of cold and dry weather lay trapped deep in the loaded bowls and just beneath the surface and around rocks on the wind scoured ridges. Cornices were loaded and heavy. That day was a blue bird day with a light breeze and mild rising temperatures. Avalanche-prone slopes were in prime condition to slide as the day progressed; all they needed was a trigger. That trigger came in the form of four snowboarders all placed in optimum locations to put stress on the unstable slope. As a result, in the blink of an eye, three people were caught in a size 3.5 avalanche – a force of nature that could destroy houses and snap large trees in two, and consequently buried its victims as deep as 5m in a debris of the snow and ice. They were not the first ones down this time bomb of a valley this day, but they were the unlucky ones. Two parties, who had gone before them, scrambled for higher ground in fear for their lives as the wall of white approached. They were fortunately far enough away not to get caught in the slide but were covered in 10cms of airborne snow produced by the air blast, a wind that is created by large powder snow avalanches like this one, and that can reach upwards of 200 km per hour and hundreds of meters in height. As the leaders of these two previous parties were experienced in the winter back country, they returned to see if there might be survivors of this huge slide that they thought must have been set off by humans. The other members proceeded out via a service road to relay a distress message. The two moved swiftly but cautiously to the debris and the ensuing beacon search that they initiated proved to be in vain as they were told by the remaining survivor of the accident that the group had not been wearing avalanche transceivers. A visual search continued by land and by a dispatched police helicopter which was on the scene within about an hour of being notified. The search that ensued for the following five days by police, volunteers, friends, search teams and rescue dog proved hopeless. (Ikeda, Enright, et al, 2000) The three boys’ bodies were found in the spring by continuing police surveillance by helicopter, as the snow melted.